As seen from the Boston Common. You can also view other participants of Skywatch Friday. Just did the tour of your most recent photographs - gorgeous! I especially love the monochrome ones. So much benches in this place..Ü And I understand why: all those beautyful tall trees provide a good shadow. Certainly a place where I'd like to sit and spend hours reading a book.. So pretty. You would never know it was in the middle of a city! This is so beautiful. I could sit there and see the clouds change for all day... Nice shot! I like the contrast between the dark green and the sky: the white clouds seem come out by trees! 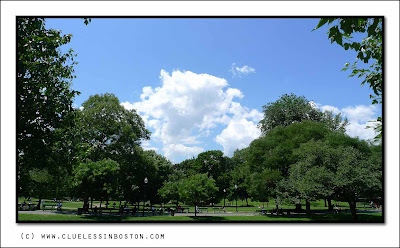 This is a terrific angle for the Boston Common. There is no sense at all of the city nibbling around the edges of this oasis. Looks like you finally have a nice day. This shot of Boston caught me off guard as the views like your 7/9 summer street come to mind when thinking about your city! Great view for SWF! Postcard perfect photo. Very beautiful photo. Very green and a clear day for outdoors. PS: I'm glad you saw the movie and loved it.Knowing you a little, I was thinking you would enjoy it. Looks like a great day there! What a gorgeous summer day! Beautiful scene - feels so summerlike! Very nice skywatch, Clueless! Looks like you're out in the middle of the countryside somewhere, not in Boston! Wonderful image! It looks summerly and reminds me of a great day at the park. Love the composition and the contrast. Quite a collection of clouds gathering in that bowl of greenery!